F for Food: SugarFISH: Would Still Be A Deal at Twice the Price. 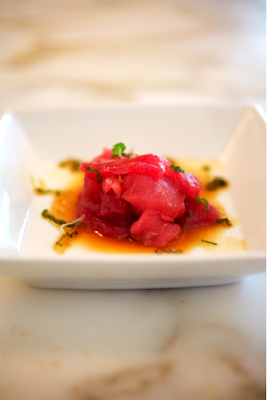 SugarFISH: Would Still Be A Deal at Twice the Price. My dad was in town visiting a couple of weeks ago so I packed our schedule with all things food. I also scheduled October’s Dinner at Eight to coincide with his visit. So maybe I was showing off a little bit. A few days prior to his arrival I received an email from the peeps at SugarFISH, inviting me and a guest for a meal. They were having a soft opening at their new location in a prime spot downtown, a stone’s throw from Bottega Louie. They officially opened on October 28. I have been loving Nozawa’s sushi for the better part of a decade. Heather took me and my ex to Sushi Nozawa before we even moved out here and I have returned many times hence. I had not, however, ever been to any of his SugarFISHeseses – or, for that matter, heard a whole lot about them. Oh, something to mention: my dad doesn’t like sushi. Or so he says. Yet, only the night before, I witnessed him happily devour a healthy slab of uni – an item that even many sushi lovers are wary of. So I figured, if I show Dad the freshest, most wonderful stuff I can think of and he still “doesn’t like sushi”, then that’s fair. Based on the website images of the other locations, I was expecting a big, open, si moderne sort of atmosphere (which is just not my cup of tea). Designed by Glen Bell of DEX Studio, to reflect the neighborhood which it inhabits, this SugarFISH is actually a fairly small space. And while it is design-y and conceptual, it maintains a certain intimacy. I dug it. The sleek combination of metal, wood and concrete, along with a smattering of clear, glass, pendant lamps suspended at different lengths from the ceiling actually give the effect of being at the bottom of the ocean with air bubbles rising to the top. Oh, and while there is a bar, there is no sushi bar at this sushi bar. The chefs are back in a proper kitchen. Immediately upon walking in we were greeted with a warm smile by one of the founders, Lele Massimi, who actually joined us for our meal. As we dined Massimi explained to us the driving force behind the SugarFISHeseses. I mentioned Nozawa above. What I have not yet mentioned is that which is Sushi Nozawa. Number one, it’s exceptional. The quality of the fish is almost unparalleled. It can also be prohibitively expensive, especially to go on the regular. And then there is Kazunori Nozawa himself. 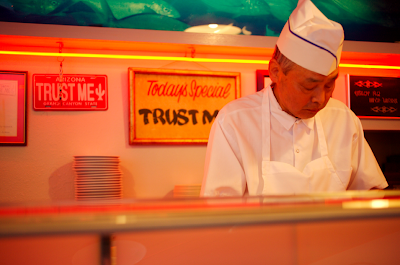 At times referred to as the “Sushi Nazi”, Nozawa has become both lauded and feared for his omakase-style “Trust Me” menu and his extreme disdain for requests for California Rolls, cell phone usage in his establishment and any soul expecting special treatment (insert any number of A-list celebrities here). 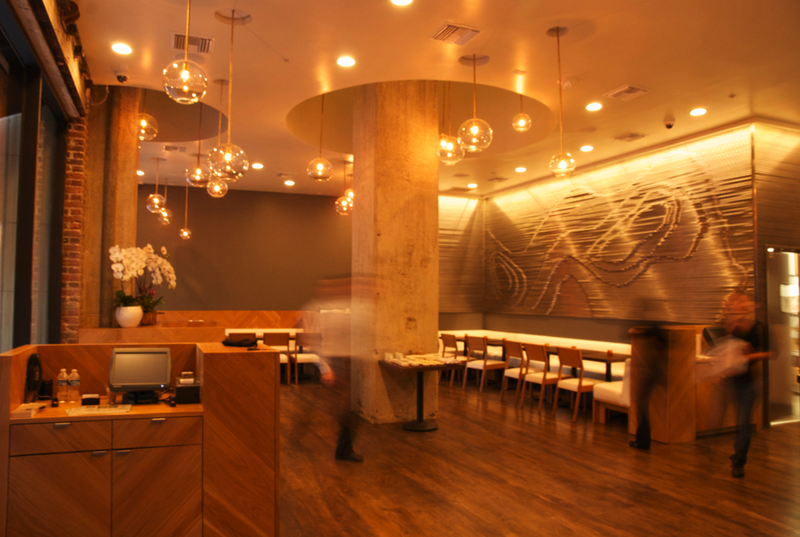 And so the birth of SugarFISH: a streamlined menu hinging around three fixed price options with the same quality of fish without the same price tag. Nozawa still handpicks all of the sushi as the first in line at the fish market each morning (5am!). And while Nozawa himself is not preparing your meal, his son, Tom, is manning the kitchen. Additionally all players back in that kitchen have been directly trained by Nozawa. As my dad and I looked between the “Trust Me” ($28.50), the “Trust Me / Lite” ($19.50) and the “Nozawa” ($35-$38), Lele decided to take matters in his own hands and told our sever that we were all getting the “Nozawa” (and then some). We opened with small plates of cold, organic edamame, which was light, lovely and crisp. This was followed by big eye tuna sashimi, which was drizzled with a delicate house-made ponzu and topped with thinly sliced bright-green scallions: diaphanous. 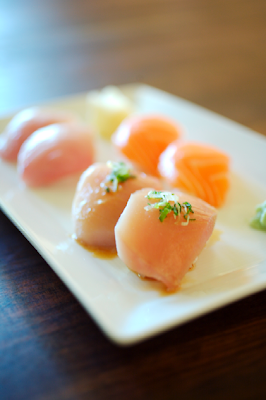 Our next plate had a trio of sushi items: albacore, salmon and yellowtail. These were all supple and rich with Nozawa’s signature warm, vinegary rice (which I adore). I believe these were followed by an order of halibut sushi and an order of large scallop sushi. The scallops were plump with a beautifully sweet brine. 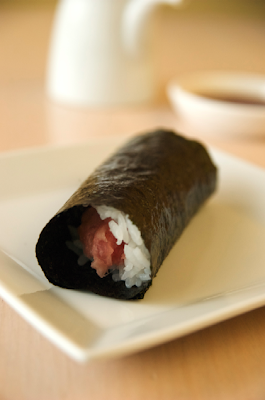 Next up was the toro hand roll followed by the crab hand roll. Sigh. So amazing. And we were informed by Lele to EAT IMMEDIATELY! Or the smartly crisped nori would no longer be smartly crisp. Noted. Always a favorite at Sushi Nozawa, and these did not disappoint tonight. The item following the rolls was a surprise even to me: halibut fin sashimi. This is something I have never had before. The fin was firm and toothsome and swimming in that lovely ponzu. This was followed by salmon eggs, which were like big salty, oceanic bursty bubbles. Oy. As you may well imagine, we were getting pretty full at this point. I was anticipating my usual ‘dessert’, uni. And so Lele had a couple of orders brought to the table. I often tend to judge a sushi restaurant by their uni and this did not disappoint. 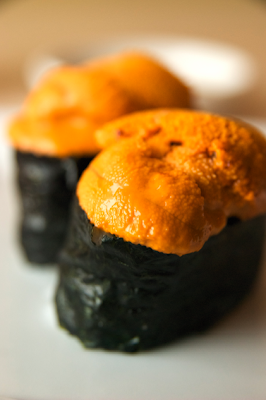 The Catalina sea urchin was creamy, briny and decadently delicious. Fortunately for me, Dad was getting so full that he could only eat one of his uni. More for moi! We capped off our culinary adventure with the more traditional sushi “dessert”, unagi. There’s was just right: sweet, savory, warm and crunchy. Ooh, la la. And so there you have it. SugarFISH has achieved their goal. They are serving up quality fish at a deal and a half. And guess what? Dad’s a convert! He loved it! All food and drinks were hosted. That is such a kind thing to say! And it means a lot to hear (read) you say it! Wow the sushi trio looks DELICIOUS. I think I kinda sorta want to eat it off the screen! I agree that this would be a deal at twice the price. The sushi is stellar. I have gone back twice and husband has gone back probably a dozen times since they offered me dinner on the house. It was nice to get a dinner on the house and be able to unabashedly write a rave review.